Imagine attendees asking questions via Facebook posts, comments and even tweets, and no delays here as they can be sent real time during a particular event. Millions of people tweeting and posting messages a day is a definite sign technology is transforming our lives. These technologies are not only limited to the Internet, businesses spheres are also benefiting from the edgy advances technology is bringing; and the world of events management is not scathed from this. 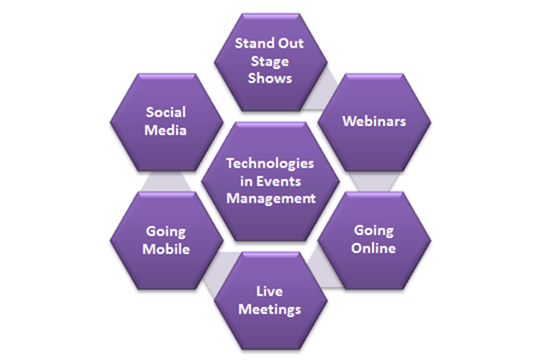 Here is a look at what the latest technology has to offer to the world of events management. Let’s take the FIFA world Cup as a good example; a huge event participated by enthusiasts worldwide. Aside from the great football competition, the technology that enabled people to know the scores and the schedules of the game real time is another feat that exhilarated and amazed people. Huge events, small events, all can benefit from a touch of technology. Stage shows are just one of the highlights in an event. Thankfully, innovations in lighting system, audio-visual and staging instruments make it possible for a stage show to really stand out. It is not just about the speaker, the content and the other ingredients. Nowadays an upgraded stage show leaves a crowd in awe and wonder. What’s more interesting is implementing such tasks does not necessarily need to become a “Herculean task”, thankfully with the help of Event Management Software, organizers can plan and implement with a breeze. Geographical distance is a thing of the past. Nowadays, wherever you are in the globe, you can attend an event or a meeting, even without a plane ticket. Live meetings and webinars enable people from different parts of the globe to participate in an event even without being “physically present”. This breaks the physical walls and barriers that prevent people from attending events. Nowadays, planners and event organizers can accommodate eager participants wherever they are. Another technological highlight of our century is the birth of social media sites such as Facebook and Twitter, and the two have definitely changed how events are promoted. Gone are the days of letters and emails, nowadays we can just “tweet”, and “poke” to promote events and let the people know. Event planners and organizers can even create fan pages to announce the event. The primary advantage of social media outlets is that it lets you communicate with the target audience at real time. This also allows people to discuss the event and the highlights even before it takes place. iPhones, Androids, Blackberrys, and other smart phones or devices employ smart technology; these have become the platform for managing events. From charting events, to locating them on your map, almost everything events related can now be done on a mobile device. Mobile apps that allow people to know events, plan and organize them are now available in the market. It is time to acknowledge the power that lies behind the mobile technology, and the sooner we incorporate this in our business endeavors, the better. Registration for events can now be done online, and this method is becoming a center stage in events management, online sites like Eventzilla is a perfect example. This site allows attendees to register online, it also allows organisers to promote via Facebook, send invites via email and it can even manage cancellations. Author Bio: The author of this events and technology article is Alfred Michaels. Alfred Michaels is an online writer on events management and the technologies that can be used to plan organize and improve an event. Alfred Michaels also writes on Event Management Software and how organizers can use these effectively. Hello Mr Alfred Michaels! I seriously want to thank you for providing such an informative article. This article, without doubt, will help all the professional event planners, both freshers and people with little more experience. Managing an event involves keeping track of many elements. However, presently there are many types of tools or software that really helps in making the process of managing an event much simpler and easier. I personally feel the mobile apps for event have actually transformed the field of event management and made the entire process smoother. Totally agree with your point on Webinars and Live meetings. It helps break the barrier. However then, the next issue is to deal with time differences.